← Why are Bats Dangerous? Bats serve a vital ecological role in our surrounding environment and local economies. Not only do they help pollinate our forests and crops, they consume thousands of flying insects each night, delivering excellent pest control for farmers and outdoor lovers, alike. And this is really just the start of what makes bats so ecologically important to our society and our planet as a whole. For these reasons, many property owners who live near wooded areas and bodies of water enjoy supporting the local bat populations. There are various ways you can join this effort, and one is to install bat houses around your property. You can purchase pre-constructed bat houses online, which range in price depending on size, retailer, and various other factors. On the other hand, if you are handy and have experience with tools, you can build your own bat house. In fact, continue below for a list of the top-most recommended bat house blueprints that you can purchase or download for free! Do Your Bat House Research First! It is important to do your research and learn how to properly install bat houses. They must be constructed and mounted according to certain specifications for them to be safe and humane for bats, and do not pose any risks to you and your home. For instance, bat houses should not be installed on trees, and instead, should be mounted on wooden posts, steel poles, or pivot poles. Additionally, they should be mounted at least 15 feet off the ground in an area that gets 6 to 8 hours of direct sunlight. 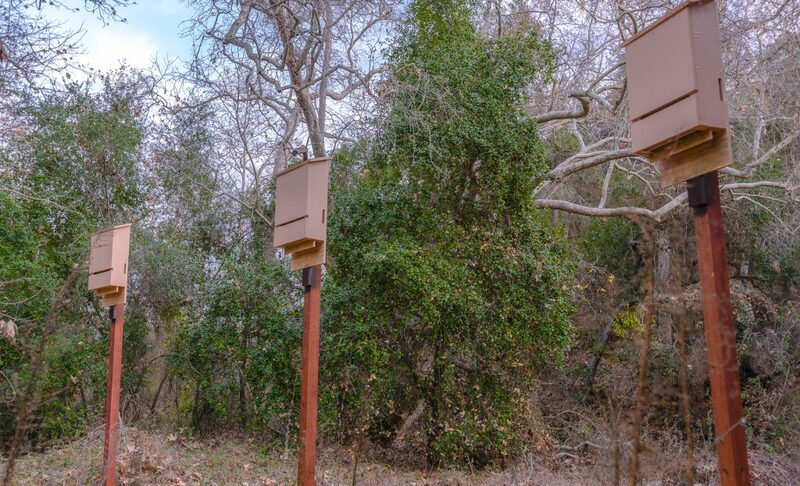 Furthermore, bat houses should be mounted at least 30 feet away from any houses or occupied structures; this is to protect properties from bat damages and infestations, as well as, keep bats and pets separated. Enthusiasts recommend the Bat House Builder’s Handbook. It is available for sale online, here. Sometimes bats can get too close, and give us trouble. If you have nuisance bats, call 317-535-4605 to speak with a friendly and knowledgeable wildlife abatement specialist about bat removal and control services in Indianapolis, Indiana. Don’t let bats damage your property and cost you thousands of dollars in renovations! Let our DNR licensed and insured bat removal specialists provide the workable solutions you need. This entry was posted in Bats and tagged bat house blueprints, bat house guide, bat house mounting guide, Bat Removal Indianapolis, build a bat house, free bat house instructions. Bookmark the permalink.